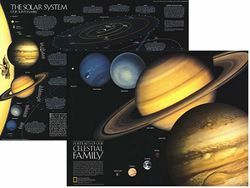 The National Geographic Solar System poster is loaded with informative text. The reverse side is a poster called "The Portraits of Our Celestial Family." Colors are chosen to reflect the most realistic appearance and drawn so that each planet appears to scale. With this product, you get two posters for the price of one!